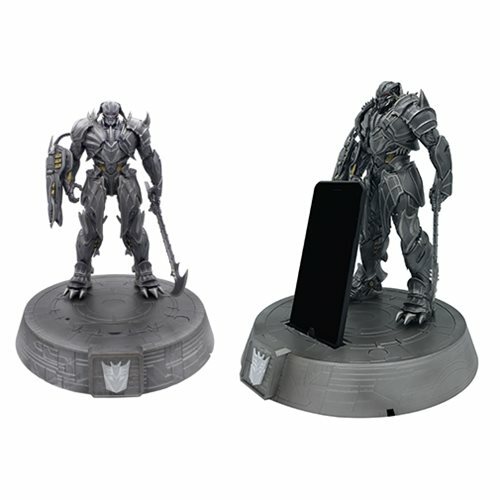 Join Megatron and the Decepticons in their quest for power with this Transformers The Last Knight Megatron Phone Stand Statue, which features a highly-detailed statue of Megatron. This impressive statue also serves as a phone stand, allowing fans to use this impressive statue as a way to conveniently charge any mobile device with a screen size up to 6-inches. The easy to use locking port supports almost all micro USB and lighting plug shapes and sizes. Included are LED lights to spotlight Megatron and the Decepticon symbol on the base! This phone stand statue measures 12-inches tall x 9 1/2-inches wide x 9 7/10-inches long.